First opened in 1977, Paris' Centre Georges Pompidou has managed to achieve something that few cultural centers have: it's thrived as a space where art and culture are fully accessible and open to the general public, rather than smacking of elitism. It's really not a place that feels intimidating. Parisians of all backgrounds and stripes flock to the Pompidou to mill around in the enormous central lobby, have a coffee with friends at the mezzanine-level cafe upstairs, browsing for books or design items at the center's in-house shops, and of course enjoying exhibits at the modern art museum upstairs. Stepping into this monstrous architectural curiosity, whose quirky design from Renzo Piano is either loved or reviled, one senses that the Pompidou truly lies at the smack-center of contemporary Parisian life. Performers draw crowds on the large, sloping plaza, while students line up to access the enormous public library. Inside, regulars are perfectly at home on the open mezzanine-level cafe. And the National Museum of Modern Art houses many of the 20th century's most compelling artworks, as well as hosting constantly interesting temporary shows. For all these reasons, it's easily made our list of Paris' most interesting and important attractions. 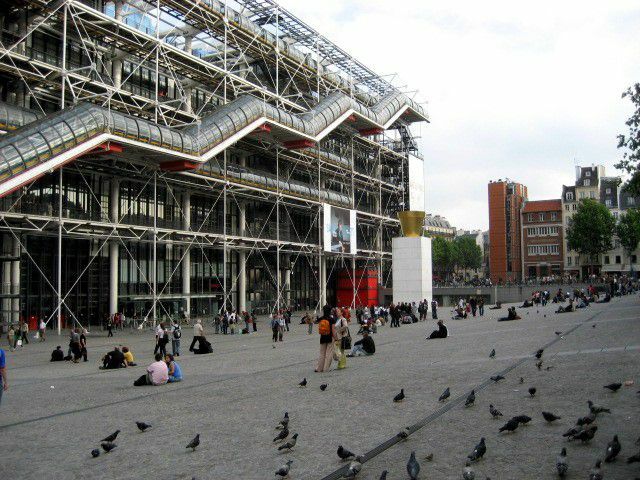 The Pompidou is centrally located on Paris' right bank (rive droite), in the always-lively neighborhood known as Beaubourg (confusingly, many locals also refer to the center itself as "Beaubourg"). See pictures of the area here. The center is open every day excluding Tuesdays and May 1st, 11:00 a.m. to 10:00 p.m.
Atelier Brancusi (Performance and Conference Space: Open 11:00 a.m. to 9:00 p.m. (conference rooms close at 8:50 p.m.) Especially interesting for discovering the studio space of the eponymous French sculptor: a real treat. Public Reference Library (BPI): Open weekdays 12:00 p.m. to 10:00 p.m.; weekends and holidays, 11:00 a.m. to 10:00 p.m. Closed on Tuesdays. Note on Centre Pompidou Security: Due to increased security measures in recent years, visitors may not bring large bags or suitcases into the center. There's often a long line to get in to the library: to avoid waiting, come earlier or later in the day. For access to Centre Pompidou's online catalogues, videos presenting current installations and artists, archives, and more, consult the center's online resources page. For detailed maps of each level of the Centre Pompidou, click here. Free wifi is now available throughout the Center. You can access the Internet for free for up to 90 minutes at the center provided you are equipped with a wifi card. The National Museum of Modern Art at the Centre Pompidou features one of Europe's most important permanent collections of modern art, comprising over 1300 major contemporary works by such 20th-century greats as Kandinsky, Picasso, Modigliani, Matisse, or Miró. The museum's temporary collections are nearly always on the vanguard and have, in recent years, spotlighted artists like Nan Goldin, Yves Klein, or Sophie Calle. If you're interested in film, make sure to check out the onsite cinemas at the Pompidou. The center hosts regular retrospectives on major cinematic talent from around the globe, as well as offering regular lectures and performances. There are several options for lunch and dinner at the Pompidou, so there's no need for visitors to worry about leaving the center for a bite before or after an exhibit. For a quick bite, the mezzanine cafe on the 2nd floor of the center (take the right escalators from the main entrance) serves hot and cold sandwiches, quiches, pizza, and desserts. Prices are a little steep, but the leisurely view of the entire center from plush red seats is more than cozy. It's no wonder so many students and writers set up shop here to work and dream. For a refined lunch or dinner and spectacular panoramic views of the city, reserve a table at the rooftop restaurant Georges. The BPI public library has a snack bar on the 2nd floor, serving sandwiches, hot and cold drinks, and snacks. Three Flammarion arts bookstores on the ground floor, 4th, and 6th floors offer an excellent selection of art and design-related books, posters, and gifts. Meanwhile, the Printemps design boutique on the first floor is a regular fixture in the Parisian style world. Explore the open boutique to find unique and offbeat design items.